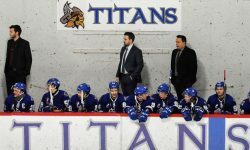 The Temiscaming Titans were crowned the GMHL champions on Friday March 27th at the Centre in Temiscaming. Playing in game #5 of their best of seven series with the Seguin Huskies in front of full to the rafters crowd of almost 900 people, the Titans edged the Huskies 3-2 to win the series 4 games to 1. The series was much tighter than the it’s result as the Titans outscored the Huskies 16-12 in the five game series and were outshot (237-201). But if not for some stellar goaltending from Craig Wood and clutch performances from many players who were at one point or another during the playoffs playing with an injury of some type, the outcome might have been different. The two teams exchanged first period goals Martin Jacobsson, who had just returned back to the team from Sweden the day before thee game opened the scoring for the Titans. Seguin ties it up at 16:12 to send the teams to their dressing rooms with the score knotted at one. The second period had both teams capitalize on power play opportunities. Marc-Antoine Arseneau scored only 2 seconds into the PP and then less than a minute later the Huskies returned the favour letting only 7 seconds run off their pp to tie the game up at two goals each. Then late in the period Curtis Warren from a pass by Andreas Magnusson let a slap shot go from just inside the blueline that was sort of like a flutter ball that completely baffled the Huskies netminder and it found the top part of the net behind him. The final period was scoreless as the Titans shut down the Seguin offence with some fierce forechecking not allowing to set up in the offensive zone too often. The final seconds ticked down with the crowd on their feet and then the celebration began. After receiving the Russell Cup from GMHL Commissioner Ken Girard, the Titans each took their turn to parade the cup in front of their home town fans to the tune of their theme song of the playoffs, Don’t stop believing by Journey. The final shot count was 41-25 Seguin and the game stars were Craig Wood, Curtis Warren and Andreas Magnusson.